This Acrylic Deluxe Pen Holder is wide enough to hold all your favorite writing utensils. With a large engraving area for personalization, this holder makes for a perfect home or office accessory. Our 2-Tiered Acrylic Business Card holder fits multiple standard business cards. It also offers an engraving area lage enough for a personalized business name or logo, this holder is a perfect home or office accessory. Keep your files as close as your keys with these 4GB USB flash drive and key chains. The flash drive swivels in to protect the USB connection when you travel and swivels out to attach to your computer. The anodized aluminum cover comes in either blue, red, or black and can be customized with your corporate logo, message or anything else you can think up. Every well-appointed home bar commands well-designed coasters. 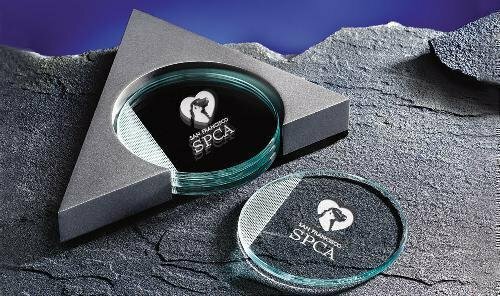 Our selection of designer coasters are made of glass and optic crystal, insuring you won't have to worry about staining as is the case with porous coasters. Choose from our beveled jade coasters with walnut caddy, silver lacquered wood caddy, or piano-finished caddy with its brass insert. All styles are available with or without caddy. Production lead time for this product is 5 days. This product has a minimum order quantity of 25. This product must be ordered in quantity increments of 25. The Acrylic Business Card holder fits a good portion of your standard business card. It also offers an engraving area lage enough for a personalized business name or logo, this holder is a perfect home or office accessory. The Acrylic Click Caddy Holder has a center divider for better organization. It also offers an engraving area lage enough for a personalized business name or logo, this holder is a perfect home or office accessory. This Acrylic holder fits your standard index card and has a slot for your favorite writing utensil. With a large engraving area for personalization, this holder makes for a perfect home or office accessory.